i actually love its simplicity, it's something i would totally wear and gives you a great figure. must try and find that choc! I love the red sole of the Louboutin! Simple but gorgeous outfit. I will say right now- I am not Audrey Hepburn. 1 square a day :/ sometimes I eat none, but to then just eat one square.... No! Looks fab! I am having a procrastination day, lots of twitter, facebok and blogger!! As I said on facebook, each time you post a picture of your loubs it makes me die a little in side that I sold my black pair. Cant beat a good pencil skirt and black stillettos! I cant fit into mine at the moment so am on a mission. Books... I just finished reading The Medici Secret, it's a crime/mystery book. I dont know if that is your sort of thing. I was given it and quite enjoyed it. I really enjoyed The Black Magician Trilogy (Trudi Cavan?) Which I read back to back recently. Total escapism, a little bit fantasy but magical and had me gripped! Mindy Kaling's book is on my Christmas wishlist. I recommend any of David Sedaris' short essay collections (Naked; Me Talk Pretty One Day; When You Are Engulfed in Flames; Dress Your Family in Corduroy and Denim). They are laugh out loud funny. I also enjoyed Chelsea Handler's books which are A LOT raunchier. The only one I did not like that much was Lies That Chelsea Handler Told Me because it was from the point of view of her friends/coworkers. @Computer girl - the more I have to do, the more I procrastinate. :) Thanks for the review - hope everyone checks it out as it sounds like a great product. Also thank you for the recommendations on books! @musingsofacitygirl - ah a girl after my own heard. I LOVE Sedaris. Have read everything he has done. I forgot about Chelsea Handler though - read one book and enjoyed it so I will get on that. Thanks! I love black outfits, but then I always feel compelled to add color in some ways, and actually often go for red shoes. But the Louboutins are even better! Yum, that choc looks good. And sometimes a simple black outfit is a winner. LOVE the shoes. Oh Laura, I would die (...well just short of) for them thur red soles. I have triiiied and triiiied to squeeze my ungainly broad size 8's into designer brands and its just a match made in hell. I feel like one of Cinderella's sisters. So until I bite the bullet and have me some amputations and geisha style foot bindings, I shall live vicariously through you. Sigh. Sometimes its great to go all black! But little details like the red soles and diamond necklace make up for it! Off to Waitrose to get some of that chocolate! The shoes are lovely, so classic. Everyone needs some like that! As for the square of chocolate a day, I have no chance. I just put a recipe on my blog actually for some white chocolate and candy cane chocolate bark and also a pistachio and cranberry one. I've almost eaten all the stuff I made. If you see how much there is in the picture you'll realise how bad that is!! Enter my GIVEAWAY to win a China Glaze nail polish set! I WAS AN UGLY DUCKLING BLOG! I'm loving wearing all black at the mo & posted on it yesterday! My friend bought me some Lindt Choc with a Creme Brulee centre....so yummy! Definitely cannot go wrong with black! I am so jealous of your Louboutins, one day I will own a pair of those red soled shoes! OH! And book recommendations, "The curious incident of the dog in the night-time" by Mark Haddon. A strange but sweet book. Aaargh totally freaked out that you have the EXACT same favorite chocolate as I do. (Since it is not an all that frequent one...)! I love the outfit despite the boredom :) Boring rocks sometimes! Craving chocolate now. I've been dying for a pair of Louboutins for ages and I've finally decided to get them. Just have to wait till Christmas is over so I'm not drooling over them when I'm supposed to be giving people their presents. Well lazy or not you look fabulous! Very classy! Have you read the "magic" books written by Christina Jones? I already read four out of five and I love them. Love the chic all black outfit. You need another pair of CLs I must say that mine are incredibly comfy but they are a different style to yours. Gorgeous Chanel I see peeking at me, what size/style is it? I love your outfit today; you really can't go wrong with all black and Louboutins! If you liked Mindy Kaling's book, then you might like "I Was Told There'd Be Cake" by Sloane Crosley. It is a hilarious book of essays- so funny yet thought provoking! It's so chic and classy. Nothing boring here! And the shoes?? A-MA-ZING!! I love all black outfits - they always look classy and put together. 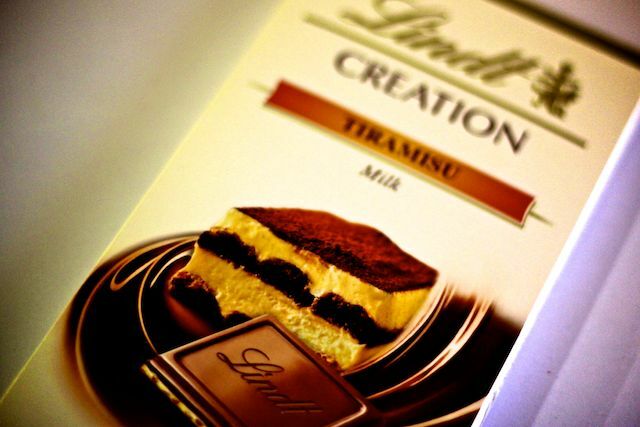 And I loveeee Lindt chocolate; never seen the Tiramisu kind before. It looks delicious! I'm a huge fan of black, and you look great in that outfit! That chocolate bar looks amazing, I'm gonna have to try it! such a simple but classy outfit =) the shoes are the best part! Cant go wrong with black! cute! All black is always chic and in style! Great outfit!! I love this outfit, you really can't go wrong wearing all black and the red soles.... to die for! All black is slimming too!! Tres Chic! Classic but beautiful outfit. those CL shoes are aaaaaamazing!!! :"> yes, a girl can never have enough of CL so go get urself more ;) it's Christmas!! 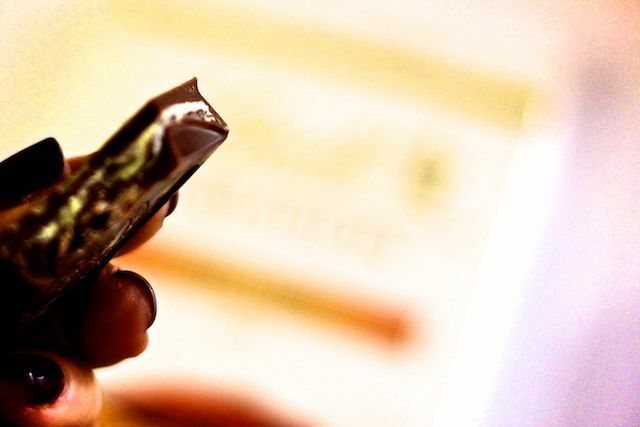 I have been looking for this Lindt bar EVERYWHERE and can't find it sold in the US. :( I am so bummed about it. Those shoes n that Purse can make anything look AWESOME! With Black one can never go wrong! Need to try that chocolate.. wow!